One of my most favorite pieces in our home is an old little work table that my fabulous father-in-law found, literally in pieces, discarded at a construction site. The dear man knows me well, reeeally well and so he knew better than to leave this little nugget of goodness behind. Of course, when he brought it home and told me he found something he knew I would LOVE, The Man in my life could sniff a project in the works. He was less than enthused. Hence, the little- table-that-could sat in a pile in the corner of our unfinished basement, legs disconnected and tabletop stained with years of use. And then one day a couple of years back, we decided that 1,700 square feet was too much space to dedicate to the art of web spinning. So we evicted the spiders and set out on the exciting road of finishing the basement. Well the basement was completed after not-too-much blood, sweat, and tears and then, of course, it was time for the best part, decorating! Lo and behold, there was the sad little table in the corner just waiting to shine. So one sunny day I asked (begged) the Mister and my dear FIL to please sand off the years of grime and put that little guy back together again. 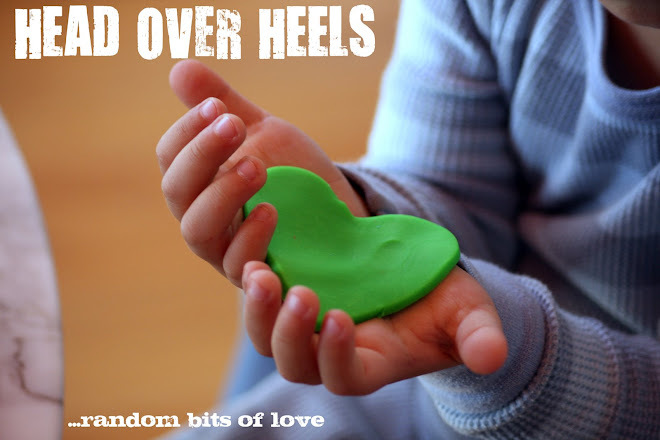 They did and much to the shock and dismay of my sweet mister, he had to eat his words. He liked the table after all, he really did. Our original thoughts were to stain it or possibly wax it and seal the wood. But we liked the natural color and smooth texture so much, we decided to just let it be. And that brings me to this post. 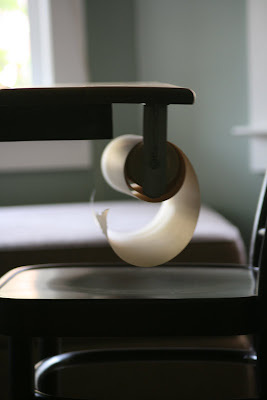 The other day I came across a shot of the first table in the line up, The Craft Table with Paper Holder from Organize.com. Well I quietly chuckled and patted myself on the back. And here comes the High ($1099.99) and the Low (mine) (free) comparison. I'd say I got a pretty good deal. 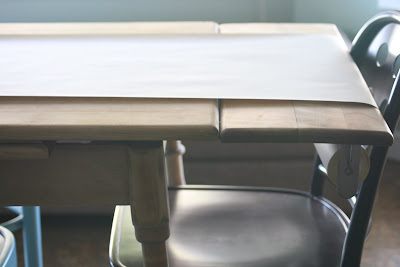 We added the paper roll to ours so that we could protect the surface when using the table as a buffet and as a surface for projects when the kiddos wanted to play. The paper roll and holder were purchased from IKEA for mere pennies and with a couple of screws, voila, not a bad imitation of the more pricey version. 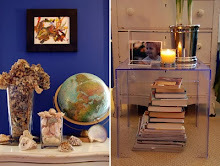 I must say, I just love our little table-that-could! And here's an idea...the last shot is of an ever-so-chic tapas party via Martha. 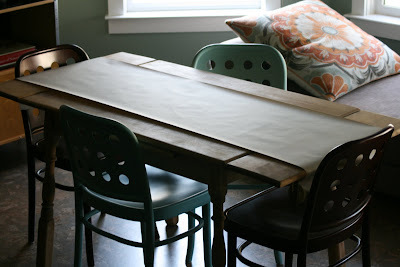 I love how the brown paper makes the tabletop fun and casual yet still very grown-up. Take a look at the "placecards." Looks like they stamped the bottom of the glass in ink, or perhaps even wine, and then wrote the guests name in the circle. Love that! Oh, I love your table! Does IKEA still sell those paper rolls? That was a fun narrative to read, too! Awesome, awesome, awesome!! 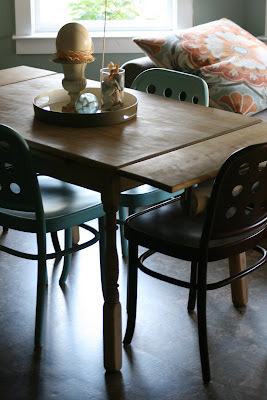 Your table (and chairs) is so cool and that paper table runner is brilliant! Thanks for sharing! Where did you get the brown paper roll? Hi Erin and thanks! Both the paper and the paper hanger thingy [ if I'm going to be all technical ;0)] were purchased at IKEA. I don't know if they still carry these. Well, if that isn't just the coolest thing I've seen in a long time, I don't know what is! That sure was a long time in the making but totally worth the wait, I'd say! Love it. And I love kraft paper anything. Hooray for second-hand furniture! It looks great with those chairs. I love your own photos. 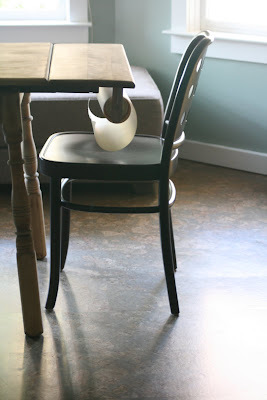 Your table is gorgeous and the paper roll is so clever. nkp, your room is spectacular! Is that your basement or did your table move upstairs? Thanks Susie! You're so sweet. 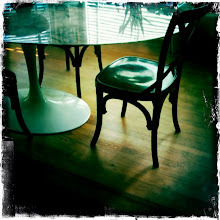 I really love that table. And yes, it still resides in the basement. Have a great weekend! I agree your table is really nice. I'd love to have something like that at my house.